Toddlers start having those moments when they no longer want to be babied and are ready to take on the world. While they are still developing, toddlers are very perceptive and pick up social behavior rather quickly. They’ll notice the way that parents take care of them and they want to be just like their favorite person. By giving your little on the perfect playmate they will be able to coddle and care for them just like how a parent would. Baby dolls are essentially a wonderful tool in teaching children basic responsibilities, empathy, and social skills. Through role playing and imaginative play, children will learn their own basic needs on a more comprehensive level as well as the needs of other people. We’re sure if you take a look at our list below you will find the perfect companion for your child. Dolls are a huge part of some children's life. They play with them all the time and when they do you want them to have the best dolls that aid in their development. This page has been updated and relfects the best dolls in the current market place. Each product has each undergone a updrage with the sections and criteria. This New York Doll Collection soft-body baby doll is just plain adorable. All extremities are made of an easy-to-clean, durable vinyl, and crafted to be as realistic as possible. Decked out in a onesie and a darling matching hat, these babies are ready to be loved, straight out of the box. 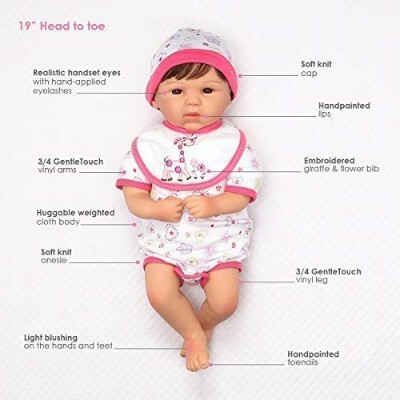 The doll measures eleven inches total from toes to the tip of the head, making it the perfect size for smaller children to hold and tote around with them. The New York Doll Collection offers this same model in several different ethnicities so children can have a mini-me to dote on that really does look just like them. The babydoll can be gently machine washed, and is soft and huggable in its middle, making it safe to sleep in the bed with your child. Children gain many skills from role-playing, including the ability to empathize and think outside their own experiences, as well as social skills and responsibilities. It’s a small, cuddly baby doll that is also easy to clean and is beautifully detailed. Children will be delighted to have a little friend that looks just like them and their much bigger friends used to when they were babies too. This Playskool baby doll is perfect for your toddler. He features five different styles that your child can practice dressing including zippers, opening and closing buttons, tying, fastening and more. He’s the perfect companion that your child will love to travel with. 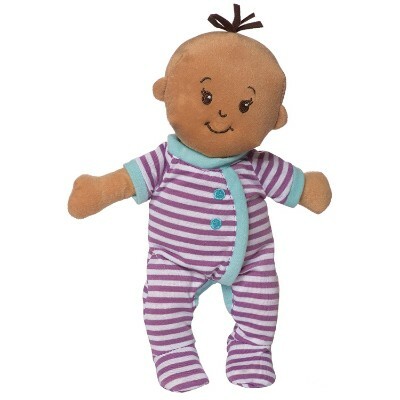 This baby doll is perfect to help boosts your child fine motor skills. 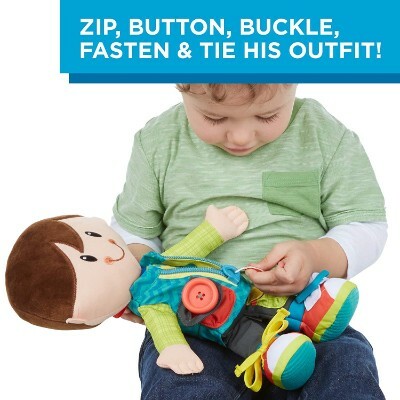 Not only will this doll help your child learn how to zip, button, fasten and tie clothing on their doll but they’ll be able to adapt it in their everyday life and be able to soon do it on their own as well. It’s the perfect toy to help them gain that little bit of independence at a young age. 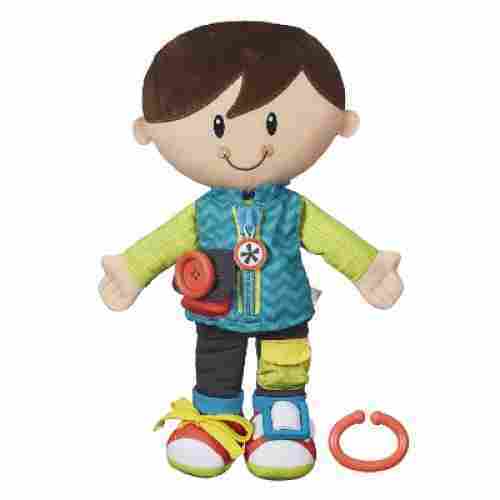 Designed to help children learn to get ready on their own this doll has everything they need to learn about clothes. It features buttons, zippers, strings, and more. It is also great for tuning in those fine motor skills. From development to fun this doll is an interactive toy that your child will love. 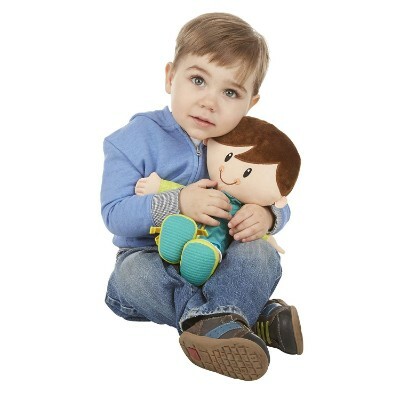 We love this doll because he is machine washable and easy to travel with. He’s toddler friendly and has a modern every day look that your child will love. Melissa and Doug are at it again with this perfect Mine to Love Doll. Brianna measures twelve inches tall, comes in a two piece outfit (with a sweet little embroidered heart on the front), and sports a functional pacifier as well. She can hold the teether or her thumb in her mouth, and is faintly scented. A soft body makes her extra huggable, while the vinyl limbs are detailed to look like a toddler. Brush her soft brown hair out or leave it up in her perky pigtails, change her outfits, help her through teething, lay her down, sit her up--take her wherever you and your family go. She’s the perfect, pretty, hassle-free companion for little ones looking to cuddle up with and care for a baby doll of their own. Children will love to snuggle up with this gorgeous doll, and play house with her. She looks a little older than some of the other baby dolls, giving them a playmate that’s closer to their own age to practice their social skills and nurturing abilities on. It’s nice to have an option that is closer in age to the toddlers looking for their first (or second! Or so-on!) baby doll. She can sit and lie down with relative ease and the pacifier accessory is a nice touch, especially since you don’t have to hold it in her mouth the whole time. A look at Sugar N Spice does remind you about the Power Puff Girls, although they do have larger heads and smaller or shorter limbs. Nonetheless, this polyester-made, fully washable my first doll can be your little angel’s best friend as it comes with super soft fabric, a wonderful dress lined in satin, and a bubbly ever-smiling character. Sugar N Spice is actually a Snuggle Buddy, one that small kids will use as their own security blanket, giving them the kind of comfort that all babies need at this age to feel secure and safe in their surroundings. Babies will love running their little hands on the smooth body and the soft dress of Sugar N Spice which can also double as tactile stimulus. The polka dots on her leotards can provide the visual stimulation that infants need for brain development. Sugar N Spice is every little angel’s dream cuddable and huggable stuffed toy. Learning to dance and enjoying music is a stage of life that no one should miss out on. This is just the doll to enhance that stage of development. 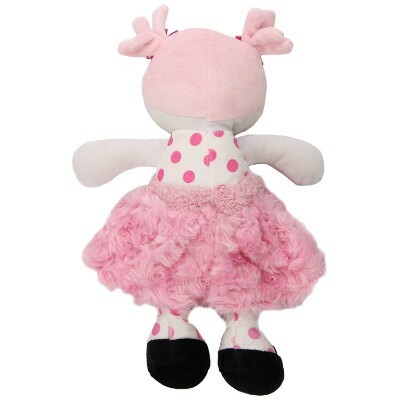 Her super cute outfit and snuggly design make children feel secure and ready to dance with their favorite doll partner. The Sugar N Spice’s lovely and friendly features are amazing while its visual and tactile features help with infants’ optimum brain development. Over the Moooon, Sarah Safari, and Tall Dreams. Each of these meticulously handcrafted and well-detailed 19-inch models comes with very realistic features from the eyes to the lips, the nose, ears, hands, and even hair. Even creases on the skin and the characteristic sheen of nails have been captured in awesome detail in these toys. Each of these realistic baby dolls are made of GentleTouch vinyl, giving it superb likeness to human skin. 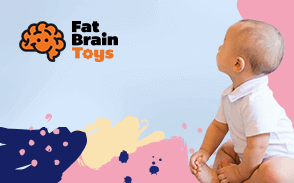 The infant figures come with their respective accessories such as clothes, feeding accessories, and even doll toys and gadgets to provide a more engaging experience for children who are going to play with these lovely creations. The Paradise Galleries gift sets are lifelike baby dolls that we wouldn’t really be surprised if you thought these were real babies. When your little one is growing up and ready to start playing with more realistic toys. This is just the doll for them. The realistic design and feel let children understand what a baby looks and would feel like without having to have a baby around. This is a great doll for developing and forming great pretend play time routines. The realism and superb details of the Paradise Galleries gift set are simply breathtaking. We couldn’t really believe somebody would go to such great lengths to come up with lifelike baby dolls. Soft, sweet, clean-scented, and fully accessorized for play, Manhattan Toy provides the perfect option for those searching for a soft-bodied doll with this Stella plushie. Wee Baby Stella is the cousin of Baby Stella, and ultra soft with no vinyl parts to be found. Her face is embroidered carefully, and the soft tuft of her hair is made of fleece so there are no hard parts whatsoever for little ones to hurt themselves on. She comes with a magnetic pacifier, a bottle, a teddy bear, and a book of bedtime stories. Tuck her into bed in her fuzzy striped onesie and read her to sleep. Wee Baby Stella measures twelve inches toll and releases a clean lavender scent when you hug her. This baby doll is soft enough to sleep on or with, and comes equipped for great bedtime role playing. While you tuck your little one in for naps or for the night, they can tuck Stella in with her teddy bear, and read to her as well. Before you know it, everyone is dozing peacefully, and mom and/or dad can sneak off to catch some z’s themselves. Plenty of soft-bodied dolls still have vinyl bits that children can hurt themselves on if they’re too young and not careful. Wee Baby Stella is entirely plush from head to toe, comes with cute accessories, and is easy to clean with a delicate washing machine cycle. Baby Stella Peach could very well be the best my first doll for any infant since it mimics many of the features that all babies are known for: sparse hair, short but stubby limbs, and a cute pacifier to boot. Our 15-inch Peach comes fully dressed in a striped, soft onesie complete with a cloth diaper, both of which can be easily removed. Her pacifier magnetically sticks to her mouth so there are no buttons involved. Her eyes and other facial features including belly button and toes are embroidered, rendering it super-safe even for younger babies. She even sports a soft tuft of hair made of fleece. Baby Stella Peach helps make sure that your young angel will have someone she can turn to when mommy needs to be away for a minute or two. She’s cute and lovable and provides the reassuring comfort that all babies need. This nurturing baby doll inspires the child to be creative while role playing as a young child. This helps develop cognitive skills and also encourages the child to use their imagination while having fun. Peach is the perfect companion for young children learning the idea of nurturing and caring for others. Unlike Annie who “wets” on her diapers or even on her potty, Mariana has just one trick up her sleeve: to blink her eyes in an effort to magnetize pretend play moms and dads to lift, carry, snuggle, and cuddle her until she’s ready to fall asleep. Oh, if Annie has a pacifier and a milk bottle, 12-inch tall Mariana has here thumb to provide pleasure during those times that mommy cannot give milk just yet. And if she grows tired of sucking her thumb, she can always count on her pacifier to bring her instant calm and relaxation. Mariana is dressed in a beautiful romper with a matching hat which can be both removed for washing and cleaning. These dolls for toddlers from Melissa & Doug make perfect tools for helping toddlers express their ideas and feelings while encouraging them to use their imagination and creativity to the fullest. Helps toddlers under the age bracket of 18 months to 5 years to be expressive with how they feel while they are practicing their imaginative and creative skills while playing. Mariana loves to be cuddled and snuggled. And she is bound to get that and a whole lot more from today’s babies. Caring for an infant is a tough job. Doubling that can be nearly impossible. 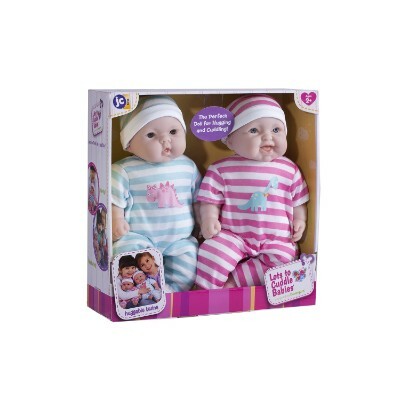 Kids can now learn to appreciate just how tricky it is to care for and nurture twins with the JC Toys Berenguer-designed Lots to Cuddle realistic baby dolls. The lifelike and super-soft bodies of the twins are designed to make pretend play really awesome. The 13-inch tall twins come with the sweetest sets of little eyes, one brown and another blue, to complement two adorable facial expressions that will simply melt your heart away. The twins are designed for non-stop hugging and caring and holding which can then form the basis for the development of self-soothing techniques by young children. Facial expressions are one of the things that children are picking up on as they are learning to walk and talk. This set of dolls is a perfect way to help introduce facial expressions and what they mean to others. The twins are also great for teaching them how to care for others while understanding and developing their own techniques for self-soothing. The different facial expressions of the twins teach kids about the uniqueness of each person. One of the largest dolls for toddlers and older children in our list is the Berenguer Boutique which stands at 15 inches. It features the same qualities and characteristics that have made JC Toys a household name in lifelike baby dolls. Its adorable eyes open and close with each change in position from standing to lying and come with highly detailed vinyl anatomy including the head, torso, and the limbs. The Berenguer Boutique makes the perfect doll for promoting social skills among toddlers as they will be enticed to talk to and care for this baby for a long time. Encouraging children to learn how to care for their dolls is something that we should always do especially when you can purchase a doll that comes with everything they need to teach them nurturing skills. 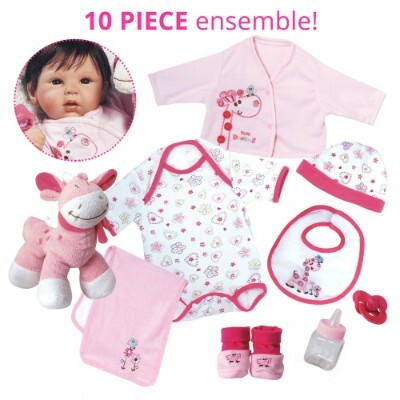 Included with this set is the items needed to teach special, from the clothes changing to feeding. The large size of the Berenguer Boutique makes it ideal as a growing kid’s favorite toy. Any manufactured doll has a recommended age appropriate range that is suitable for your child. This is mainly due to the range of physical development and requirement of your child’s age. For instance, if you buy a doll that is for an older child, maybe around the age of seven, you could give it to a three-year-old and they wouldn’t understand how to enjoy the doll properly like the seven-year-old would. The hair of the doll will also be difficult to maintain as well as the clothing. The doll also might not be cuddly enough for a three-year-old and too heavy for her to move around with it. At the end of the day, the child would abandon the doll in the toy box and then everyone else would assume that they just don’t like dolls rather than having a doll that’s age appropriate for that child. This is why finding a suitable age appropriate doll is extremely crucial for your child because it’s not just based on the advancement of your child but on his or her physical capacity and developmental stage. For infants, it’s recommended that dolls should have two types of hair, the rooted and the wigged. Mostly because hairstyles for these baby dolls are usually long and most girls in this age bracket are generally going to start having an interest in hair styling. For these children, the more and longer the hair available on the doll, the more adventurous it can be. Dolls with rooted hair: this is securely and systematically attached to the head of the doll by use of a specific machine that knots the hair of the doll to the inside of the head which prevents hair from loosening. Rooted type of hair is very very tough and washing, brushing or styling it can do no harm whatsoever. It’s very easy to notice if a doll has rooted hair because you will see small sections of hair that are arranged in specific order. Dolls with wigged hair: Wigged hair is made of a mesh and the hair is knitted by hand in particular rows to mesh. The already made wigs are securely glued to the head of the doll. There are instances where short strands of hair can be visible. These are the end of the strangs that are knotted on the wig lace. Wigged hair is more expensive as compared to the rooted hair option. Wigged hair gives allowance to manufacturers to design hairstyles that are realistic in the appearance of the doll and can stay longer than rooted hair. Partings and fringes are muddled and able to give the baby doll a lot of hair styling options that your children could give her. These different hairs can be brushed and styled to any liking that your child wishes. However, it can be delicate since it requires your child to take a lot of care of it so that that the hair doesn’t get wet. It’s preferable and recommended not washed. Careful babies are best with playing with wigged hair since they will take good care of it. While the rooted hair can suit any baby since no special attention is required. Among the different kinds of toys known to man, dolls remain one of the most sought after and the most valuable especially in terms of helping young children find more meaning in the world they live in. That’s why we had to keep this in mind when we chose the best dolls for this list. First, they must be soft enough for younger children to find comfort in playing with these toys. Second, they should have movable features to allow children to manipulate these easily to conform to what kids have in mind. Third, they must also be made of safe materials while their construction must also not bring harm to kids, especially the little ones. Fourth, these infants’ and older children’s toy figures must have obtained a considerable acceptance among parents and their children as evidenced by the number of positive reviews as well as the average customer satisfaction score of each product which we pegged at a minimum of 4.2 stars. Lastly, in cases where there is a tie between two or more products, we considered the reputation and credibility of the toy manufacturer. These were essentially the steps that we had to take in coming up with a list of the 10 best baby dolls in 2019. Dolls are a great way to teach developmental skills like social interaction. When playing with dolls children often play house and this helps teach them how to communicate with each other and how to cooperate. When playing with dolls children are able to learn about caring for others. As they learn to care for others it helps teach them about compassion and selflessness. For every parent the safety of their children is one of the most important things that parents have to worry about every day. This is why we made sure to always consider this when looking for the best dolls for your children. The dolls material should be made of nothing but harmless materials so that it can be used by your child endlessly without parents having to worry. More kids these days are reckless and would do anything with the doll including beating or throwing the dolls at each other as they are playing. Signs of the doll’s material tear and wear or even the doll’s pieces getting loose could be a choking hazard as your child is playing with it. The manufacturers details are either on the packaging of the doll or on the doll itself. It’s recommended that whoever is buying the product should not pick a product that has no manufacturer’s details and sometimes the CE marking, no matter how attractive, appealing or enticing the doll might be. Whether we care to admit it or not there are just so many benefits of playing with dolls. These can include remarkable improvements or enhancements in a child’s psychological and emotional well-being to complement developments in his or her physical and social aspects. Now, we said “his or her” because experts strongly recommend that “ALL” kids should play with baby dolls. And here are the reasons why. Develops nurturing and caring skills – The traditional view of men as uncaring and unfit for showing caring and nurturing attributes is now slowly being dissolved. In its stead are daddies who are more hands-on when caring for their babies. They are not ashamed to be seen in public carrying their little ones, hugging them, feeding them, and even changing their diapers. Children today need to appreciate this changing norm and that young boy will be better prepared for the future if they play with dolls today so they will develop essential caring skills and nurturing techniques that will make them better dads in the future. Enhances motor skills – Young children will learn to button and unbutton their shirts a lot better if they train using dolls. This provides them with the needed motor skills to accomplish other things. Boosts cognitive skills – Doll play is not all about having fun as it also involves thinking in the form of imagination. Kids can conjure of images of a caring mom or a nurturing dad. These provide the necessary ingredients for optimum cognitive development. Helps build social skills – Dolls don’t talk back yet they provide the medium upon which young tots will learn how to communicate and build relationships with others. This helps prepare them in interacting with other people. q: Will buying my little girl a doll that looks like her affect her negatively? No, buying your girl child a doll that looks like does not affect her negatively. Instead, it is a very good way to positively reinforce the child’s self-image. Most manufacturers have embraced not creating dolls with a range of skin colors and hair. To reflect on the modern society, they produce a mix of dolls with varying looks. q: Is the doll’s price a factor to consider while choosing the best doll for my girl? The price of the doll is definitely a good factor to look upon when selecting the perfect doll for your child. You should always stick around your approximated budget to ensure that you do not spend more than you should have on a just a doll. But at the same time, one should keep in mind that most of the economic units are most times not trustworthy. There are different price ranges for different categories of baby dolls. Doll models manufactured from famous brands are considered to be on the higher price point and having good quality. You can also find not well-known brands that have good quality dolls at a fair price. The bottom line should be one should consider other factors in selecting the best doll for the child alongside the price. q: What are the general safety tips while using the baby dolls? It is important to make sure safety measures are put in place when you have a baby doll for your child for her, especially if she is younger than six years. The following are some of the tips. q: Is it recommended for my girl to change the baby doll’s clothing on a daily basis? Change of the doll’s clothes on a daily basis is not advisable because they lead to the paint and/or the seal to wear thin and can lead to damage of the baby doll. Washing of the doll frequently is not advisable either or brushing/combing the hair regularly can lead to the hair strands of the baby doll to break, damaged or pulled out. More care instructions of the baby doll are explained in the user manual from the manufacturers that comes in the packaging of the baby doll. q: What is used in making the insides of the dolls? There are different materials that are used when making the inside of baby dolls. Most top babydoll companies, through use the recommended best quality materials. The best weighing and stuffing materials are premium poly-fill and premium glass beads. Most baby dolls though are supposed to be light enough for the targeted age range child. Some baby dolls, especially for younger kids are rather not filled with anything or just a little premium poly-fill. For the hair bows and pacifiers, strong earth magnets are used. q: Do real baby clothes fit baby dolls? 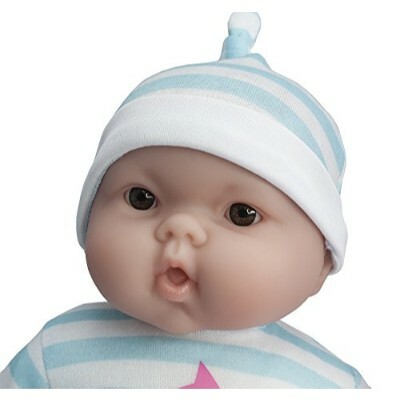 Most manufactured baby dolls are designed to approximate the size of a real baby and hence, often the clothes of a small baby can fit a baby doll. Just like there is no exact size of a real baby, different dolls are also sized differently depending on the age bracket it is designed to fit. Baby clothes also come in different sizes, it is best to try the clothes on your baby doll when you get it home. q: What are the materials used in composing most babydoll products? For purposes of safety assurance to the customers, most babydoll manufacturers comply their materials to the international toy testing standards and also the individual state standards within the region the manufacturers are situated. This will guarantee the safety of your child when she is playing with the doll. Mostly, vinyl and ABS plastic are used to make the body of the baby doll. This is because the PVC used in the products does not have Phthalates and are lead-free.